Chris and Alison spent 4 weeks discovering Patagonia's highlights and hidden corners, from the very tip of South America to Buenos Aires. They hiked in the popular Torres del Paine National Park and kayaked through the lesser-known Northern Fjords, staying in a mix of hotels, home-stays and camp sites. Chris had travelled to Patagonia twice beforehand, once cycling coast to coast, but this trip was Alison's first. USD $210 per person per day for all activities, transfers and accommodation. Chris & Alison chose to arrange their own domestic and international flights. As keen hikers, Chris and Alison wanted to discover the best hiking Patagonia has to offer. They also wanted plenty of variety, so we planned a trip that allowed them to try a mix of activities. With 30 full days on their hands they had time to see some of the more unusual corners of Patagonia as well as the more well-known regions, so we created a trip that offered them the best of both. 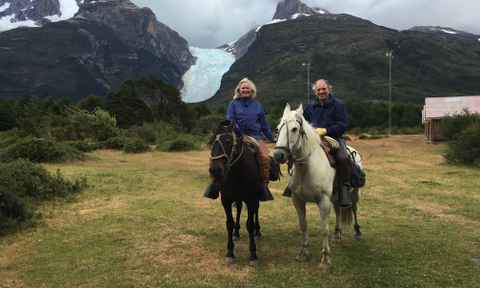 Chris and Alison asked to stay in a mix of hotels and more down-to-earth accommodation so we revelled in the chance to show them traditional Patagonian hospitality and arranged a few nights in a home-stay. Chris and Alison started their trip in the very tip of Chile: Puerto Williams, on Isla Navarino. After an early boat across the Beagle Channel they checked into their home for 3 nights, the wonderfully located Lakutaia Lodge - a great base for exploring Tierra del Fuego ('Land of Fire') and Cape Horn. They explored the area by bike and on horse back. After crossing back over the Beagle Channel and into Chile, we based Chris and Alison at Ushuaia for another 3 nights exploring the southern tip of Patagonia.They visited an estancia by boat, going via a penguin colony, and enjoyed views of the Channel from Martial Glacier. Chris and Alison really made the most of every day! Crossing the Beagle Channel by Rib to Puerto Williams felt like reaching the end of the Earth - and it is. Especially with the view towards Cape Horn. Chris and Alison were keen to travel overland where possible, so we arranged for them to travel from Ushuaia to Puerto Natales by public bus, enjoying the landscape along the way. As Chris had previously visited Torres del Paine, they decided to do a self-guided W trek. We pre-booked their refugios and transfers into and out of the park and arranged their briefing the night before, but they chose to do the trek without a guide. After successful hikes to the base of the towers, Lago Nordenskjold, the French Valley and Glacier Grey - culminating in a catamaran crossing of Lake Pehoe - Chris and Alison boarded the Navimag ferry from Puerto Natales to Puerto Montt in the Chilean Lake District. The trip took 4 days so Chris and Alison had a cabin on board. The ferry was a well-priced and enjoyable way for them to see more of Chilean Patagonia as they made the long journey north. Torres del Paine was busy in January, but the huts were well organised and the trekking routes stunning. During Chris and Alison's Navimag journey, they had the opportunity to stop off at Puerto Eden and to spot humpback whales as they sailed over the open ocean across the Gulf of Penas. After their arrival in Puerto Montt, they continued on to Puerto Varas. From here, we arranged for them to be driven to Cochamo village, ready for their self-guided hike to a mountain lodge. Our partner provided them with maps and advice for their hike. After a final hike and transfer down to Puerto Varas, Chris and Alison met up with our local kayaking partners. After a full briefing they set off on their kayaking and wild camping adventure around Pumalin Park. Over 7 days they sea kayaked around Comau Fjord, visited several hot springs, enjoyed plenty of swimming and even had time for some trekking, too. We enjoyed some really out of the way camping as part of our kayak trip, and would love to camp in Patagonia again. After a 7-day adventure, kayaking through the Northern Fjords, we helped Chris and Alison take the bus north to Pucon in the Northern Lake District. Overlooked by the Villaricca Volcano, Pucon is famous for being an adventure sports hub. We based Chris and Alison in a centrally-located family-run hotel, where they spent some time soaking up the views of the volcano. Chris and Alison spent 2 days mountain biking and reflecting on their adventure. On the final day of their trip, they took an overnight bus from Pucon to Santiago, from where they moved on to Ecuador. We loved helping such an intrepid pair plan their Patagonian adventure! Patagonia is still a wild and romantic place, with a rawness to its scenery like nowhere else. We had a wonderful time both on and off the beaten track, trekking and kayaking (paddling moonlit fjords at 2am is a must!) and a bit of biking too. We took some ideas along to Sally at Swoop, who also made some helpful suggestions, found great places to stay and put it all together for us, so that our month travelling went almost like clockwork (when our Navimag boat was delayed 12 hrs by bad weather, our taxi was still there to meet us). We wouldn’t hesitate to recommend Swoop. Tempted by a Tailormade Adventure? Get in touch today to talk about your dreams for your trip. Whether it’s a 2-week or 2-month adventure, you’re travelling independently or in a big group, you want to see Patagonia in comfort or discover challenging hikes, we’d love to help.